BE SURE TO CHECK OUT THESE PAGES TOO! Scandals have plagued Hollywood since very early on. Think you know your cinema scandals? . . . . Have fun checking these out! Doris Day . . . a name long respected in Hollywood for a very talented lady . . . and usually thought of as being extra nice without a shadow of a blemish. What a lot of people don't know . . . or don't remember . 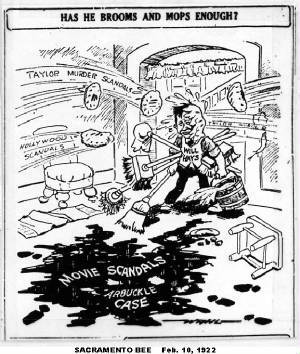 . . is that Ms. Day was indirectly involved in one of the most shocking murders in Hollywood history: The murders of Sharon Tate and her friends at the former home of Day's son, Terry Melcher. Domminick Dunne knew a few things . . . about Hollywood and New York Societies. So click on the link, sit back and be ready to be shocked! 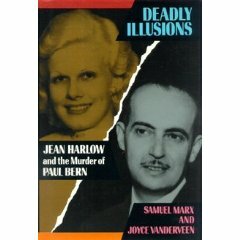 Samuel Marx was one of Paul Bern's closest friends and business associates who was there at the Harlow/Bern House after Bern's body was found. Marx's story is the intertwining of death, coverups, politics and more rolled up into a real-life whodunit. His co-author, Joyce Vanderveen, brought a new light on the story that compels both of them to go back and find out just what DID go on - or didn't! The estate’s terraced grounds are pockmarked by gopher holes and overgrown with grass that sprouted after recent rains — growth that neighbors know will turn brown when summer returns. A pond is partly filled with rainwater. Weeds poke through cracks in a curving asphalt driveway. Why has the current owner kept the home as it was on Dec. 6, 1959? Will another family ever again bring life to the estate once described in a sales ad as “beautiful” and “delightful”? Built in 1925, the three-story Spanish revival-style home has a basement that boasts a maid’s quarters. The first floor features an entrance hall flanked by a glassed-in conservatory and large living room. Toward the back is a den, a dining room and the kitchen. “No one has lived there since the murders,” said Dr. Cheri Lewis, who grew up across the street from the mansion and still lives in the neighborhood. When two younger children were awakened by the victims’ screams, Perelson told them they were simply having a bad dream, his youngest daughter told police. “Go back to bed. This is a nightmare,” he told 11-year-old Debbie. She and her 13-year-old brother, Joel, escaped injury. Eighteen-year-old Judye Perelson ran from the mansion and staggered to a neighbor’s house. She was treated at Central Receiving Hospital and then taken to General Hospital with a possible skull fracture, The Times would report the next day. “Judye came to our door. I remember having my hand in her blood,” recalls Lewis, now a Beverly Hills dentist. Police found Perelson lying dead on the floor next to his wife’s blood-soaked bed. He was still clutching the hammer. On a nightstand next to his bed, investigators found an open copy of Dante’s “Divine Comedy,” which was opened to Canto 1. “Midway upon the journey of our life I found myself within a forest dark, for the straightforward pathway had been lost . . . ,” read the passage. In Judye Perelson’s sports car, police found a note written to an aunt that told of the family being “on the merry-go-round again, same problems, same worries, only tenfold. My parents, so to speak, are in a bind financially.” The teenager spoke of getting a job to help the family out. “I asked the owner of the home where we were working why it was there, and she told me the story,” said Kalupski, a Hollywood resident who now is an ad agency producer. His friends didn’t believe him when he told them what he’d seen. So he began a ritual of driving them to the Los Feliz hillside to show them the abandoned mansion. He took Hollywood Internet entrepreneur Babette Papaj there two months ago. “It was dark and scary. I was afraid to get out of the car,” she said. The woman pushed open a rear door and walked in, but she didn’t get far before a burglar alarm went off. She turned around and left, joking later about “ghosts” when she returned to Waterson’s home. Soon, her hand was throbbing painfully. “She’d been bitten by a black widow. There was a red vein going up her arm. She had to go to the doctor,” said Waterson, a clothing company executive. A year after the murders, in 1960, the mansion was sold in a probate action to a Lincoln Heights couple, Emily and Julian Enriquez. Neighbors remember that the pair visited the house and brought property there to store but didn’t move in. “We had major problems.,” explained Jude Margolis, a former neighborhood resident who now lives in Hancock Park. Enriquez inherited the mansion when his mother died in 1994. Since then, he has been approached many times by potential buyers but has steadfastly refused to sell. He tells everyone he hasn’t decided what he wants to do with the property. “I asked him why not lease it, at least. You can’t have a house sit empty for 50 years and not expect it to fall apart. It’s a tear-down now. It’s a shame,” Margolis said. “There are all kinds of stories about the house. Rudy’s a very nice man. He’s just not interested in doing anything with that house. He’s never going to sell it,” said Hurley, a lighting company sales manager. Enriquez, a 77-year-old retired music store manager who lives in the Mount Washington area, said he remains uncertain about his plans. “I don’t know that I want to live there or even stay here,” he said. He might relocate to Hawaii or Arizona, he added. But it has nothing to do with the mansion’s violent past. “I’ve never looked at it as being haunted,” he said. “For a time I had two cats inside there and I had to go often to feed them. I still go there often — I was there last night, in fact. I think now I’ll be going more often.